The Shin-Yang Duo consists of guitarist Kang Min Shin and violinist James Yang. They performed on Show 324 in New York, NY, on May 24, 2016. 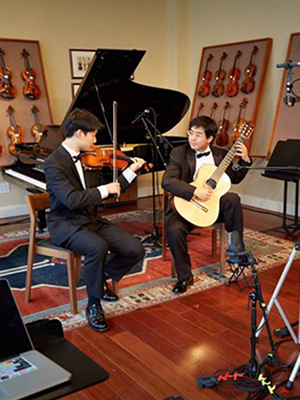 The Shin-Yang Duo includes 16-year-old guitarist Kang Min Shin and 18-year-old violinist James Yang. Both study in The Juilliard School’s Pre-College Division and attend Tenafly High School. Kang Min is in the studio of Tali Roth, and James in the studio of Hyo Kang and I-Hao Lee. They are currently deepening their understanding of guitar-violin repertoire by performing and studying together as a chamber group at Juilliard.